Today is the 800th birthday of the Magna Carta; a document more revered than read. Issued and acknowledged on this date, is was almost immediately repudiated by King John. Or the Pope, depending upon whose version of history you happen to believe. It happens to have suffered much the same fate that many of our own documents have – we feel we’re supposed to know what it says, but we really can’t be bothered to read it for ourselves. Thus, our own Constitution and the Magna Carta make for uneasy bedfellows, in reality; with the codifying of slavery in the one and the codifying of serfdom in the other – rather than the romantic view that popular culture and the various politically aligned think-tanks would have us believe. A trial by a jury of your peers was originally but a trial by peers; that is, a trial of the landed class, by the landed class. Have you read the Magna Carta? If so, which version did you read? Did you know there was more than one version? It seems that Americans hold the Magna Carta in more esteem than do the British. But then, if you haven’t read it, the same reversal might be said of our own Constitution. I find the most passionate advocates for our Constitution to among those who live elsewhere; and the fiercest yearning for ‘freedom’ to be not among those who pound the word for political gain, but in the hearts of those who do not have it. Perhaps it will ever be thus… but it seems a shame, to have to go to a stranger, a foreigner, to learn the lessons of your own history once more. And it seems a bit apropos, that the cartoon below should appear on the 800th birthday of the Magna Carta. Even though it’s not very relevant at all. Still… there are those who will believe the pundits, simply because the pundits claim to be an expert on the issue at hand. Our freedoms do not come directly from the Magna Carta – though they might owe a distant ancestry to that document – no matter what the Tea Party would have you believe. But then, you’ll never know, will you? Until you read the document for yourself. And until you start thinking for yourself. Magna Carta image found here. this was a good read, thank you. 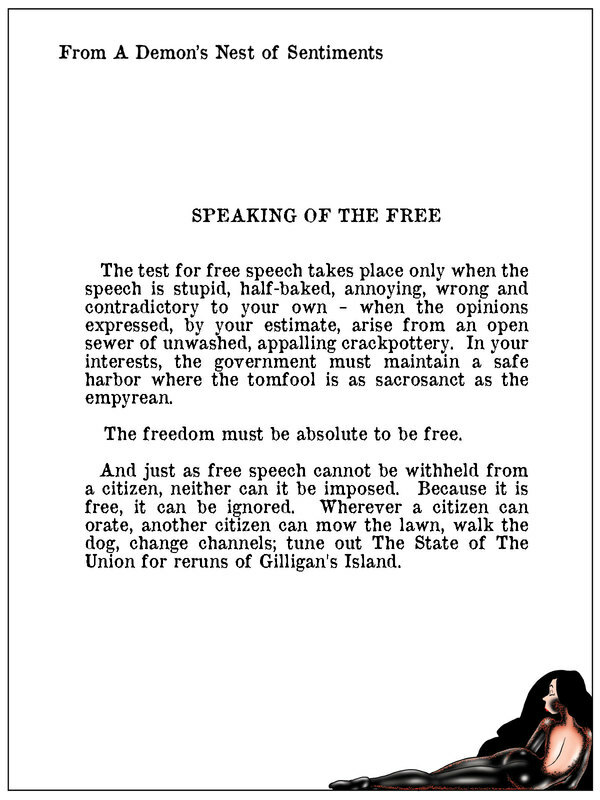 Freedom of speech does not imply a right to be heard. Nor does it imply a right to the belief of others in what you would say… in spite of what I, or any other pundit might wish to the contrary… But until Neil deGrasse Tyson celebrates the rights of that ultra-conservative church in Florida (rather than calling for their muzzling), I’ll continue to pound on my soapbox until the suds come home!